There are more than forty different types of berries that are often referred to as goji berries, known in Tibet as pang jia. But Tibet Authentic's goji berry - the largest and most mature berry grown in the mountains of Tibet - is considered by ancient and modern-day doctors and scientists to be superior to all other goji berries, wolf berries and goji derivatives such as goji juice products. 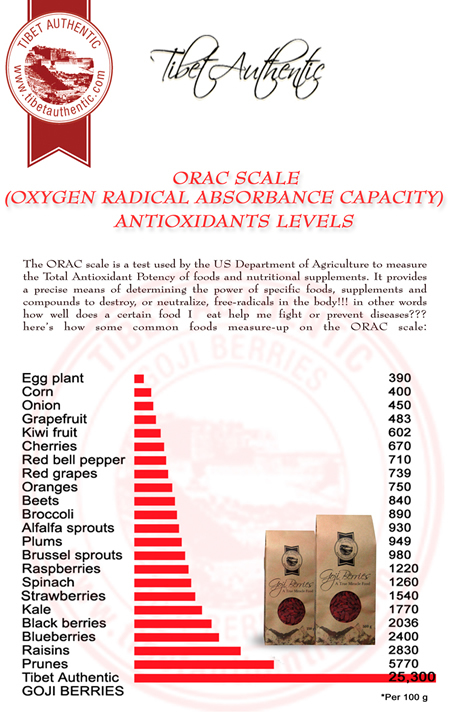 Only Tibet Authentic's goji berries have passed the Tibetan Medical College's rigorous quality selection criteria. According to the Tibetan Medical College, our goji berry. 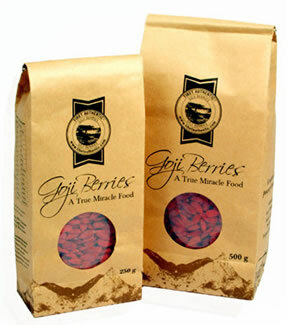 The goji berry contains 18 amino acids - the building blocks for protein. The goji berry contains over 12 times more protein than apples, oranges, or strawberries. The goji berry is a better source of beta-carotene than carrots themselves. The goji berry has higher levels of vitamin C than oranges. The goji berry contains polysaccharides, which can help prevent cancer, neutralize the side effects of chemotherapy and radiation, normalize blood pressure, balance blood sugar, combat autoimmune disease, act as an anti-inflammatory, lower cholesterol, and increase calcium absorption. "Lycium [the goji berry] tonifies jing [vital energy] and qi [breath] and strengthens the yin tao [capacity for physical exercise]." "Pang jia [goji berries] cure illness related to the heart and clear heat [discomfort and illness] within the body." © Copyright 2012. Tibet Authentic, inc. Essenex Inc.